Bhiksuni Chueh Hui 慈惠法師 is a highly respected & talented scholar in the Taiwan Buddhist Academic & Cultural circles. She has contributed greatly to the positive development of Buddhist Culture & Monastic Education. She is the CEO of the 佛光山文教基金會 Fo Guang Shan Foundation for Buddhist Culture & Education. In recognition of her educational, cultural & spiritual contributions to Taiwanese society she received the 2nd R.O.C Social Peace Movement Award from the President of Taiwan, R.O.C. Bhiksuni Chueh Hui 慈惠法師 was born into the Yo Lan Zhang family. She lived in the countryside & her parents believed that girls should get an education so she went to 省立蘭陽女中 Lan-Yang Girl’s Senior High School & excelled in ethics, as well as, academics. After high school she worked at the Taiwan Inland Revenue. 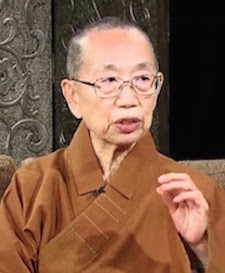 During this time she noticed Venerable Master Hsing Yun’s graceful manners & wide knowledge. Therefore, she took refuge under him & translated from Mandarin to Taiwanese during Dharma talks. Since then she has translated which focused her skills in reading, logical thinking, reflex & structural thinking. In 1965 she became a Buddhist nun under Ven. Master Hsing Yun & went to Miao Li Fa Yun Temple to receive her Bhiksuni and Bodhisattva precepts. In 1967 she and a very small in number monastic brothers and sisters started to build Fo Guan Shan Monastery under Ven. Master Hsing Yun’s supervision. Bhiksuni Chueh Hui 慈惠法師 then went to Ōtani University 日本大谷大學 Kyoto, Japan to get her Master’s degree & she became Taiwan’s First Bhikshuni to graduate with an International Master’s Degree. After her return to Taiwan she immediately took up a teaching post at the Buddhist Institute to train more professional monastics. When Ven. Master Hsing Yun retired as Abbot in 1985, Bhiksuni Chueh Hui 慈惠法師 became the Assistant Manager of Fo Guan Shan Monastery. Her Monastery’s Four Main Columns for building Humanistic Buddhism are: Education, Culture, Social Welfare, & Group Dharma Practice. Bhiksuni Chueh Hui 慈惠法師 directs development in the field of Education & Culture. She served as the first Director of Student Affairs in 1964 of 壽山佛學院 Shou Shan Buddhist College, later named as 東方佛教學院 Eastern Buddhist College. Under her leadership & efforts, the Fo Guan Shan Monastic Educational System has evolved into 3 Levels and 11 Faculties for producing highly trained Bhiksunis and Bhiksus. In 1957 she establishedYilanTzu Ai Kindergarden 宜蘭慈愛幼稚園, the first Buddhist Kinder Garden in Taiwan, & later directed the Kaoshiung Pu Men Kindergarden 高雄普門幼稚園. Then she became the Founding Principal of Pumen Junior High 普門初中, Senior High 高中 and Night School 夜校. She also pioneered International Buddhist Academic Conferences, planned and run by students & volunteers.